It seems like nearly everyone has a sweet tooth for chocolate, but not every town has a local chocolatier. The neighboring Jackson County, N.C., towns of Sylva and Dillsboro have not one but two chocolatiers for locals and visitors to choose from: Baxley’s Chocolates and Dillsboro Chocolate Factory. Either will satisfy any sweet craving. The Baxley family creates premium handmade chocolates in small batches using the highest quality ingredients available. Baxley’s offers a full line of traditional chocolates including caramels, toffee, meltaways, truffles, as well as fudge, brittle, and many unique confections. Baxley’s is always open 10 a.m.–6 p.m. Mon.–Sat., and until 9 p.m. on Friday nights “Crafting Sweet Memories” for its customers. The Dillsboro Chocolate Factory handcrafts its award-winning chocolates with the finest ingredients starting with Venezuelan cocoa. Many delicious treats are available in milk, dark & white chocolate. The Dillsboro Chocolate Factory makes 15 flavors of fudge and some of the best espresso drinks at its coffee bar. There is large selection of whole bean coffee, as well as beef and wild game jerky. Both chocolatiers plan on having Valentine’s Day themed specials in February. Baxley’s is offering 6-ounce boxes chocolate-covered strawberries in dark, milk or white chocolate for $11.00. All of their pre-made boxes are buy one and get one of equal or lesser value for 50 percent off. Baxley Chocolates also teams up with local brewery Heinzelmannchen for a beer and chocolate pairing on Saturday, February 18. Sample six Baxley chocolates paired with six Heinzelmannchen beers. The event is drop-in anytime between 6 to 9 p.m.
Dillsboro Chocolate Factory will feature a variety of Valentine’s Day themed treats for the holiday. Baxley’s Chocolates is located at 628 West Main Street in Sylva. For more about Baxley’s Chocolates, visit www.baxleyschocolates.com or call 828-631-3379. Dillsboro Chocolate Factory is just 1.6 miles north at 28 Church Street in Dillsboro. 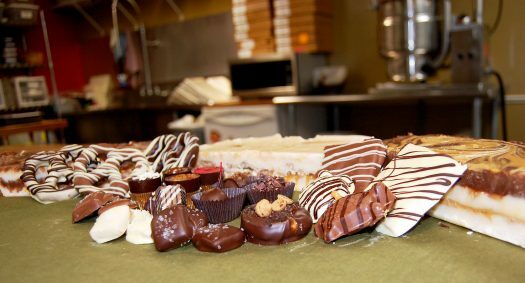 For more information about the Dillsboro Chocolate Factory, visit www.dillsborochocolate.com or call 828-631-0156.